Property 11: Apartment in ancient castle with shared swimming pool, surrounded by vineyards. 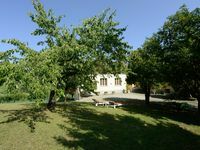 Property 12: Historical house in the heart of Mombaruzzo. Property 23: A holiday home with balcony in a luxurious farm complex with swimming pool. Property 31: Charming apartment in a historic castle in Piedmont. Property 41: A holiday home with balcony in a luxurious farm complex with swimming pool. Paola's place, Cascina Scoviglio, is a little slice of paradise, a mini-oasis away from everything. We absolutely loved it and highly recommend. Contrary to other reviews we found it easy to find. 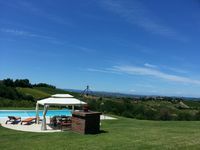 The house has everything you need: cooking facilities, ping pong table, pool, etc.. We enjoyed the incredible views of the local countryside while sipping wine and limoncello on the patio and we enjoyed talking to Paola as well. She is an incredibly interesting woman whom we hope to stay in touch with.